Say No To Destroying the Gansevoort Market Historic District. STOP MASSIVE DEVELOPMENT ON GANSEVOORT STREET. A DEVELOPER IS PROPOSING TO BUILD TWO MASSIVE BUILDINGS ON HISTORIC GANSEVOORT STREET IN THE LANDMARKED MEATPACKING DISTRICT. One is an EIGHT-STORY, 120-FOOT-TALL STRUCTURE to be built at Gansevoort & Washington Streets. A second SIX-STORY, 98-FOOT-TALL building is being planned just to the east. This massive development will dwarf the remaining buildings on this block. This proposed project threatens the unique character of Gansevoort Street, its historic streetscape, low buildings and market-style architecture. These are the very values that were embodied in the Landmark Preservation Commission’s 2003 decision to landmark the GANSEVOORT MARKET HISTORIC DISTRICT also known as the Meatpacking District. Any alterations or new construction on these sites must be approved by the New York City Landmark Preservation Commission. Please join with us to make sure that LPC rejects this proposal. In addition, these sites are governed by a restrictive declaration (RD-94) that prohibits office use on this site. The developer will be applying to amend this declaration to allow office use. The community is asking that any attempt to amend the restrictive declaration be rejected. If the developers cannot get office usage they may re-think their plan. Check this site for updates as more information becomes available – and for up-to-the-minute news, please “like” our facebook page: facebook.com/SaveGansevoort and follow us on twitter @SaveGansevoort. (Update: On August 15, 2017, the appellate court unanimously granted our motion for a “stay pending appeal” which prohibits the developer from doing any exterior work on 60-68 Gansevoort and 70-74 until the court can rule on our appeal. In order to grant us the stay, the appellate court had to find that there was a substantial likelihood that we would obtain a reversal of the lower court decision which approved the massive Gansevoort development project. The appellate court rejects the vast majority of request for stays that it receives, so the fact that the court granted our request is very significant. More information is here. What’s the point of landmarking and preservation if it can be changed? These structures are part of the history of the MPD and need to be preserved. Gansevoort Street is BELOVED- it is iconic – the proposed development will not just alter one building but will radically change a whole street scape – a lot of people are very upset about this – there will be widespread opposition, no doubt. It is important to preserve the old and historic because that is what gives authenticity to great cities. Gansevoort Street is very special because it embodies the gritty charm and rich history of the old Meat market. The low buildings are key, demolishing Gansevoort’s historic warehouses and allowing towers will make a mockery of why Gansevoort Market was LANDMARKED in the first place in 2003. Hoping our neighbors will get behind Save Gansevoort, sign our petition, leave a comment, come to meetings and get involved. We need your help. Together we can save Gansevoort Street’s low buildings and historical charm. This neighborhood has given enough. Be fair leave us with some history. How can you have an historic district without history? How will the neighborhood deal with the traffic? The special character of the Meat Packing District, which attracts multitudes of tourists to the area would be ruined by the construction of 8-story buildings in its midst. It would also remove light and sun from nearby residents, who already suffer from late night noise and traffic generated by businesses in the area. A very short sighted idea indeed for not realizing the special character that draws people into the area for the sake of outsized profits for a few. Destroyong the only human scale areas in this part of town is just unfair, unwanted, and unneeded. This is unbridled GREED at it’s best. STOP this NOW . I don’t want to hear construction noise and smell construction dust fir two years or more. This is a very green and luxurious are to live. Let it stay this way! This projesct is an insult and a nightmare for the West Village. 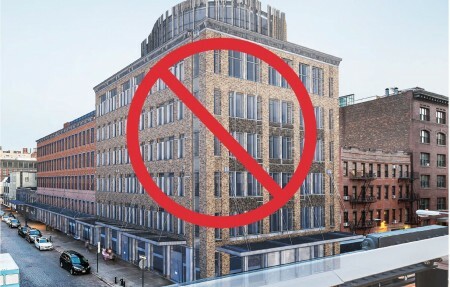 If the Landmarks Commission approves the requested changes on Gansevoort Street it will undermine the purpose of creating historic districts and encourage continuation of the attacks by the NY Real Estate Board. These misleading attacks have demonized historic preservation despite the fact that it is a major factor in the rise of property values and increase in tourism. The Landmarks Commission needs to be an independent arbiter, not a tool of the Real Estate Board as it has lately threatened to become. Nor should it be allowed to undo the work of previous Landmarks Commissions by violating previous historic district decisions. This sounds terrible. The area has already changed so much (and for the worse) the past few years. Let’s not allow this to happen. Let me know how I can help. We just won a Prelim Injunction Feb 9 ’17. Unusual to prevail. So hope still remains. Full hearing in March. Hoping for best. Spread the word. We need support. This is getting pricey and any sums folks give (thru Historic Districts Council) is being carefully deployed. There will be nothing left to love if we keep ruining that which is already there. Ganesvoort street is beloved because of the sky you can see and the history that you can feel! If we do not protect these parts of our city- they will not exist and Ganesvoort will loose what makes it special. The Landmarks Commission is charged with preserving this Historic Place – New York City — not greenlighting the wholesale destruction of our shared sense of Place, of History. No to Gansevoort Monster Development!!! There is no justification for violating this historic zone. Aurora Gottlieb has a wonderful opportunity to enhance the Gansevoort Market district with a creative design that maintains the festive aura of a marketplace, welcoming the many visitors who stroll along the light-filled street toward the neighborhood-sensitive new Whitney Museum. The soon-to-be closed food court has been an ideal amenity for this much-visited tourist destination. Why not reconstruct it and name it for Bill Gottlieb? I don’t even live anywhere close to this area but really not happy about the terrible changes that already took place in this area of the far West Village. The whole spirit of this small and special neighborhood has already been altered with all these stores, hotels and restaurants. Like wiping out a page of the City’s past. How much money is needed to stop this? Where do we stand on the “Save Gansevoort” funding. I not only would like to participate but would like to get other people involved in stopping this. People like myself, who don’t live in this neighborhood but are sick and tired of the dramatic changes in the fabric of our beloved City. Please go to our donation page and donate. We just won a Prelim Injunction Feb 9 ’17. Unusual to prevail. So hope still exists. Full hearing in March. Hoping for best. Spread the word. We need support. This is getting pricey and any sums folks give (thru Historic Districts Council) is being carefully deployed. Just please keep reading the Save Gansevoort web-site for updates. Any donations are appreciated.